Italian brand Ferrino has returned to the UK marketplace with a new range of tents but are they here to stay? Trail magazine reviews the Atrax two-person tent. Hillwalkers in the UK are lucky to have an abundance of outdoor brands to choose from, and this creates fierce competition with only those that can satisfy the British hillwalkers’ needs managing to survive. Over the last 25 years Italian outdoor brand Ferrino has come and gone from our shores, but its latest wave of products may be here to stay. The Spring 2018 range of rucksacks, sleeping bags and backpacking tents are causing ripples, thanks to features that appear to be ideal for British hillwalker. Trail obtained one of the first two samples of the new Ferrino Atrax 2 backpacking tents and we took it to the Lake District to find out how it performs in typically wet and windy British conditions. The Atrax 2 is designed for backpacking with two people, so it gets a porch and entrance on each side, as well as a small packed size and a low weight. The material specification is good too, with a flysheet, inner and groundsheet all made from ripstop nylon rather than less durable polyester, and silicone-coated for waterproofing. The inner tent has a large section of mesh to allow more airflow and to keep the weight down. Pitching is quick and very easy, even on a blustery Lakeland day, with just four pegs needed to secure the groundsheet of the inner to the ground. The poles are interlinked with internal cord and easily form a skeleton whose ends can be easily located into eyelets at the corner. A double eyelet on the cross-member at the top allows easier pitching. With the inner pitched the tent is very stable. 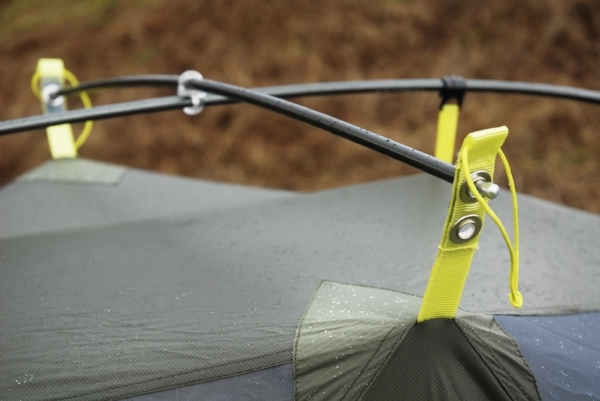 The flysheet is draped over the top with eyelets hooking over the pole ends and a few pegs completing the pitch. A guyline at each end and ladder lock adjustments all help make this very easy to pitch. Once erected the structure is very stable, but there is quite a large gap between the bottom edge of the flysheet and the ground, which means wind and rain can drive under the porch, particularly on more uneven wild pitches in the hills. This gap does increase airflow of course, but in really wet weather I’d definitely prefer a more ground-hugging design. There are doors and porches on each side of the tent, with good external storm flaps on the zips to keep rain out. But annoyingly you cannot open these doors from the top, so you cannot take a sneaky peak outside to check the weather without fully opening the door from the bottom. This also means you can’t open the top of the door for ventilation, although there is a large vent beside the top of the door. You can, however, open the whole side of the tent if you wish, which will be great for summer weather. The porches easily take a couple of rucksacks each, so you can store one person’s gear in each porch and still have plenty of room to get in and out. The inner has a massive amount of space for a tent of this weight, and I found two people can sit up easily due to the steeply-angled walls inside. The inner has a lot of mesh and the flysheet is high off the ground, so this is quite a draughty tent that’s far better in warmer weather than cold, wet and windy conditions. It is very stable though, making it great for wild camping in the hills. Compared to other two-person tents that weigh less than 2kg, the price is very good for the space you get. The lighter but similarly-designed MSR Hubba Hubba NX weighs around 1720g but costs around £390. But if you are prepared to carry a little more weight you could get the very similarly-designed 2294g MSR Elixir 2 for around £240. So it comes down to how important the weight saving is compared to your cash budget. But clearly the Ferrino Atrax 2 compares favourably with the competition.